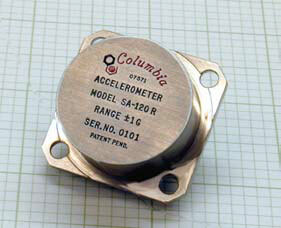 Columbia Models SA-120RHT and SA-125RHT Force Balance Accelerometers have been designed as Measurement While Drilling (MWD) sensors for use in downhole well service applications. The Model SA-120RHT operates from +/-15 volts supply and is capable of operating at temperatures of up to 200 degrees Celsius. Model SA-125RHT requires +/-5VDC and operates to 190 degrees Celsius. Both sensors are completely self-contained and provide a high level, low impedance output eliminating the need for high temperature signal conditioning. In addition to exceptional high temperature performance, the small size, rugged construction and low power consumption have made the SA-120RHT and SA- 125RHT sensors the accepted standard for use in downhole high temperature mapping. Consult the factory for customized versions of these sensors.